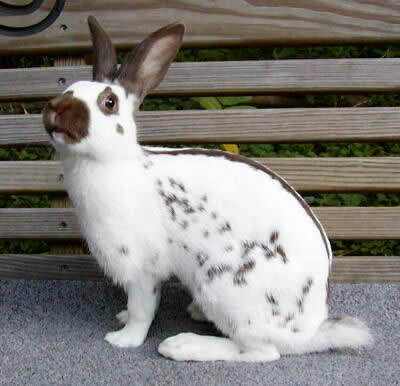 The English Spot Rabbit is prized for its beauty and graceful appearance! English Spot rabbits are mid-sized rabbits that are very active. They eat very little compared to most breeds its size. This, along with their love for running and jumping, contributes to the breed's long, slender build. The English Spot Rabbot has a generally calm disposition and tolerates other pets very well. When handled starting at a young age, they can make good pets. But they are not the best choice for small children due to their high energy level. English Spot does are known for being great mothers. Sometimes they will even raising young rabbits of other breeds in addition to their own litters. The origins of the English Spot are uncertain. It is believed to be a descendent of the English Butterfly, and is known to go back to at least the mid-1800s. The breed was brought to the United States in 1910. Once sporting patches of color, the English Spot was selectively bred to achieve today's spotted pattern. The English Spot's body has a full arch and long, slender limbs that are perfect for running. Its head is well proportioned with the rest of the body, and its ears are fairly long, colored and upright. The most important feature in the English Spot is its markings. Only half of the rabbits most litters have the traditional markings, with spots and a stripe down the back. These are the only ones that are featured in shows. The rest of the average litter is split between solid-colored and partially marked rabbits. Recognized varieties of the English Spot include black, blue, chocolate, gray, gold, lilac, and tortoise. All of these names refer to the rabbit's spots, as no background color other than white is permissible. English Spots are reasonably easy to find, especially if you aren't looking for show quality. Prices range from $5 for pet quality rabbits to $50 for show and breed stock. I have an English Spot rabbit because we found him in a park nibbling at some grass. He had owners before us but they didn't want him (I don't know how it's possible not to want my bunny!) and they had him litter trained for us. I have learned lots from my rabbit and I have studied English Spots so ask me any questions you may have about them and their behaviours, what they eat, etc. Reply with any questions you may have or stories about your rabbit or small habits your rabbit might have (I like learning new things so I can take care of my rabbit better). Thanks everyone. Hi I just got an English spot male desexed 1yr old. He wss friendly first 2 days. But is getting aggressive. Nipping & biting very hard. Our family inherited an Engilsh Spot rabbit a few months ago. I built a pen for her outside up off the ground about for feet. I built walls on hinges so they can fold down and a solid roof. My question is, should I put in a heat lamp for her because tempature can go down to high 20's to low 30's. Is there anyone out there that can answer my question. I've looked on a lot of websites and no answer yet. Thanks. Yes, put a heat lamp in. That is cold. You can place the lamp so it doesn't hit the entire area but one end of it so your bunny can move around to a place where the heat from the lamp is comfortable for them. I would put a heat lamp in, just in case. My rabbit doesn't seem to be affected by the cold and happily runs about in 20-30 degrees celsius. I let my rabbit spend his evenings inside the house where it's warm. He changes completely when he's inside. He changes from the energetic, curious rabbit to the relaxed, sleepy, affectionate rabbit. It's adorable! These Rabbits look very cool and I love the spot designs on them! Same here, they're so loving and nice sounding, I want one. Just gradually start feeding less and less pellets, until your bun is kept on a hay based diet. Remember, this must be very gradual. If your bun starts to lose weight, that's great! If you want, you can slowly introduce the pellets again once she's normal weight again, but you can also just keep her on hay. Hope it helped! Also, it's easier to stop an English Spot from getting overweight than many other breeds of rabbits the same size. English Spots also love jumping around and running. They are slender in body shape and beautiful. Uh oh. I'm sounding like my english teacher. Anyway, English Spots are the best and I have one myself. I don't know what I would do without him.